Highroller Casino will then reward you with a bonus (Welcome Bonus is for new players only). The terms and conditions of the bonuses vary between different casinos and might also change over time and between different countries, so it is important to compare the different offers and read the T&C for Highroller Casino before signing up. 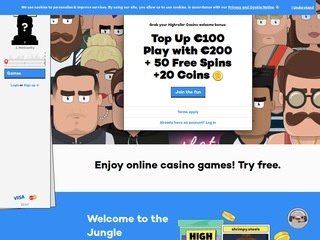 Highroller is an online casino launched in 2017 by Betit Operations, a Malta-based gaming operator. It offers a totally new gaming experience taking you to Metrocity, a setting for the story that starts unfolding once you sign up with the casino. Joining the casino itself looks like a game, as you are offered to create an avatar and move up the progress map to make use of different rewards. You can do it by playing all sorts of casino games, virtual and live, coming from some of the leading names in the industry. Needless to say, the casino can be accessed from both desktop and mobile devices. You may be a bit perplexed once you enter the gaming venue as it is introduced as a dark metropolis full of thrills, heists, games and rewards. Despite its sinister introduction, the casino offers a well-organised content you can enjoy on your mobile device without any loss in its quality. It allows an easy navigation with categories like Slots, Live Casino and Jackpots at your fingertips. As a way to say welcome to new members of the community, Highroller offers generous while existing customers can benefit from different incentives as they wager real money. Highroller Casino is available in English, German, Finnish, Swedish and Norwegian and it is present on Twitter, but has had no posts so far. Being operated by the company based in Malta, the casino holds the online gaming licenses issued by the Malta Gaming Authority. On top of it, it is licensed by the UK Gambling Commission. Both bodies are trustworthy and guarantee that the gaming establishment works in compliance with the industry standards. The gaming venue offers more than 800 casino games provided by some of the most reputable software developers. All the games are available in instant-play mode and load quickly whether you access them from your desktop or mobile device. Its extensive portfolio includes slots, table games, live dealer tables and jackpots. A list of contributing providers is long and includes industry veterans such as Microgaming, NetEnt and Play’n Go as well as relatively new yet successful developers such as Quickspin, Pragmatic Play, Push Gaming and more. 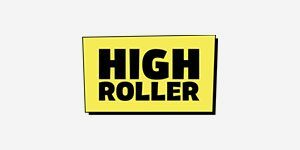 Highroller has a great variety of slot games on offer with the most popular and new ones featured in the Top Games section. Slots is a section dedicated to this type of casino games and here you can find all the slot machines available on the gambling site. You can search them by their title or click on the hashtags on the right-hand side of the site to browse games with specific features like New on the Street, District Legends, High Volatility or Classics Vibe. At Highroller, you can play some of the most popular titles like Immortal Romance, Starburst, Book of Dead or Bonanza with new titles like Astro Pug, Joker Gems or Wicked Tales: Dark Red added to the library on a regular basis. The Jackpots section is a perfect destination to all players who seek a more thrilling gaming experience with titles like Mega Moolah on offer and progressive jackpots ticking away. Table Games is a casino section for those gamblers who prefer more traditional forms of entertainment. Here you can join virtual tables and play different variants of Blackjack, Roulette, Baccarat and Poker games. When it comes to Other Games, Highroller offers only one game in this section. It is a lottery-like game Flying Pigs Bingo. If you are into Video Poker, the good news is that you can play a dozen of its variations at Highroller. To access them, visit the Slots section and click on the Video Poker hashtag. Those looking for an immersive gaming experience can pay a visit to the Live Casino section and choose from tables powered by Evolution Gaming. A suite of their standard games is on offer with Blackjack, Roulette, Baccarat and Poker tables available. All tables are hosted by real-life dealers and you can choose from regular and VIP Blackjack tables, European, American or Lightning Roulette, Dream Catcher, Football Studio and Ultimate Texas Hold’em or Tree Card Poker, to name a few. To provide its customers with a world-class user experience, Highroller supports a wide range of payment methods. They include major credit cards, bank transfer and popular e-wallets as well as local banking options such as Trustly, GiroPay, ecoPayz, Zimpler, EntroPay and Sofort. The list of withdrawal methods is more or less the same and depends on the country your have registered with the casino from. A minimum deposit and withdrawal is limited to £/$/€10 and transactions are processed with no fees charged. Depending on the withdrawal method you opt for, cashing out can take up to 3 business days. If you need any kind of help, feel free to reach the Highroller customer support team available around the clock, 24/7/365. You can send them an email using the address [email protected] or simply use the Live Chat feature and fill in the form to start a session on the needed topic. The FAQ section is also available providing you with answers to the inquiries related to the casino policy and most common technical issues.